400 World-Class Beers, 30 Unique Cask Ales & Live Music! 1. It's one of the Southeast's longest-running and most loved beer festivals. Discounted hotel rooms are available at The Graduate Hotel on the night of the Brew Fest. CLICK HERE. 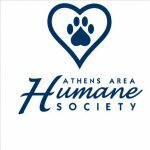 Athens Beer Week is an exciting seven days of spring beer events in the beautiful college town of Athens, Georgia on April 4-10. Come out and support local craft beer! 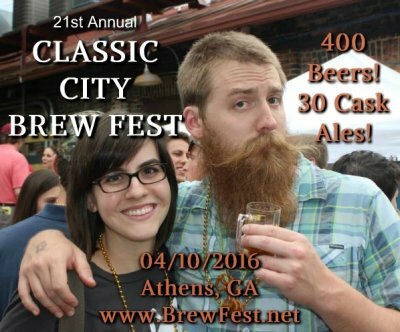 Enjoy brewery tours, beer dinners, craft beer celebrations, special tappings and MORE during Athens Craft Beer Week that culminates on Sunday, April 10 with the 21st annual Classic City Brew Fest! 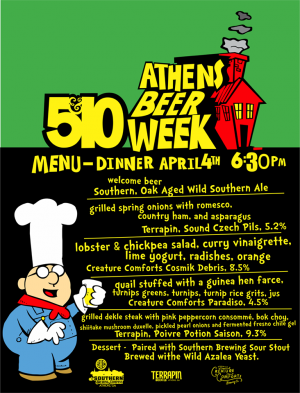 06:30 PM - FIVE & TEN / TERRAPIN, CREATURE COMFORTS & SOUTHERN BREWING Blow-Out Beer Dinner to kick off Athens Beer Week. Food by chef Hugh Acheson! Call 5&10 at (706) 546-7300 for reservations. BLUE SKY pint night with Monday Night Brewing. BRIXX PIZZA - $1.95 craft drafts (23 taps) all day long. BRIXX PIZZA - $3 local drafts (13 taps) all day long. 05:00 PM - CREATURE COMFORTS brewery tour. 06:30 PM - Optional preview VOLUNTEER meeting for the Classic City Brew Fest at Trappeze Pub. 08:30 PM - HI-LO LOUNGE Terrapin trivia with host Caitlin Wilson. 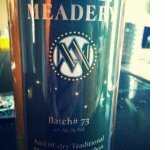 Vintage French Toast Wake-n-Bake, a special cask and other Terrapin drafts. Schwag and tickets to the brewery will be given out throughout trivia. 05:30 PM - TERRAPIN brewery tour. 06:30 PM - TRANSMET West (on Oglethorpe) Beer Dinner and tap takeover with Southern Brewing Company. 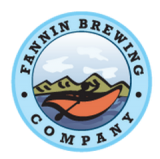 THE PINE - Monday Night Brewing pint night and food pairings. 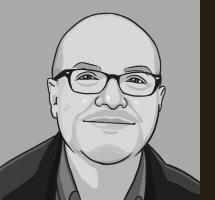 04:00 PM - HI-LO LOUNGE Reformation Brewery tap takeover. 05:00 PM - SOUTHERN BREWING COMPANY tour. 06:30 PM - TRAPPEZE PUB taps amazing Terrapin barrel-aged beers. 06:00 PM - HI-LO LOUNGE Reformation tap takeover. 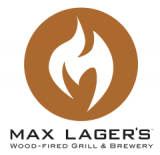 07:00 PM - CHOPS & HOPS JailHouse Brewing / Southern Brewing Company dinner. 11 AM - 4 PM - THE PINE offers Terrapin pints and taco specials. 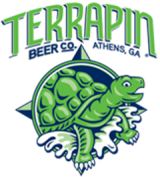 01:00 PM - TERRAPIN brewery tour. 04:30 PM - SOUTHERN BREWING COMPANY cookout with Chops & Hops at the brewery. 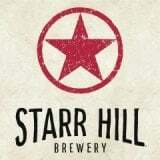 Live music from Scarlet Stitch, special brews and grilled items from Chops & Hops. 11:00 AM to 01:00 PM - Catch 22 Beer Brunch - 3 courses, 4 beers, $35. 12:00-04:00 PM - SOUTHERN BREWING COMPANY. Crawfish boil & pig picking with Champy's Famous Fried Chicken at SBC. 01:00 PM - CREATURE COMFORTS brewery tour. 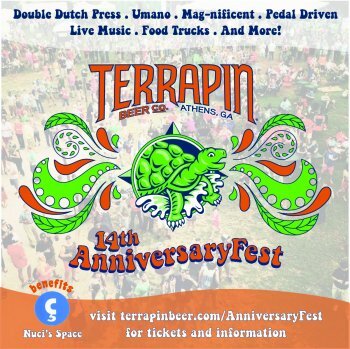 04:30 PM - TERRAPIN 14th Anniversary Fest at the brewery with live music and special brews. A benefit for Nuci's Space. 12:00 PM - SOUTH KITCHEN & BAR Brunch. 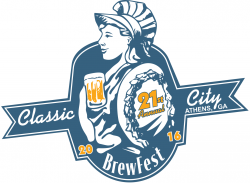 02:30 PM - 21st annual CLASSIC CITY BREW FEST, Graduate Athens Hotel. 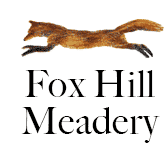 400 beers to sample, Cask Ale Pavilion and live music! 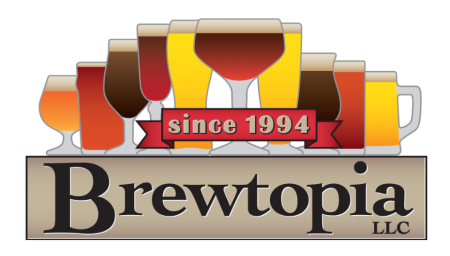 06:00 PM - POST-BREWFEST GATHERINGS at COPPER CREEK brewpub and TRAPPEZE PUB. HI-LO LOUNGE will offer beer-related food specials and $1 off all drafts. BRIXX PIZZA will tap Bell's Hopslam after the festival and offer BOGO pizzas with a Classic City Brew Fest ticket. This Berliner Weisse ranks as a fruited treatment of regular Athena dosed with real fruit puree during fermentation. 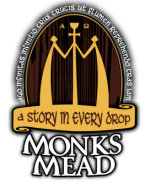 This brew is superbly refreshing, with impressive fruit notes backed by clean, lactic sourness. It's craft beer and yummy fruit antioxidants - all in one can! An elegant, quaff-able golden lager loaded with noble Czech Saaz hops and pilsner malt. A world-class Bohemian-style pilsner. Sound Czech is now available year-round in 12 ounce cans. This piquant saison contains a mild dose of peppercorns, providing enhanced aromas and flavors of citrus and earthy spice. 6.2% ABV with wheat and Munich malts and Saaz and East Kent Goldings hops. 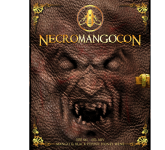 This rich, 10% ABV imperial stout offers balanced notes of dark cocoa and espresso beans with a pleasant bourbon oak character, achieved by aging the beer for months on chipped bourbon barrels prior to bottling. 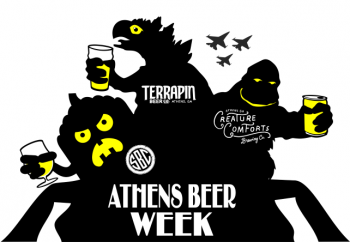 04/04/2016 - 5&10 ATHENS BEER WEEK KICK-OFF DINNER with Terrapin, Southern Brewing and Creature Comforts. Call 5&10 at (706) 546-7300 to reserve your spot(s). Owen and Nick Allen head out a beer road trip on March 25 from Georgia through Baltimore, Richmond and Philadelphia. 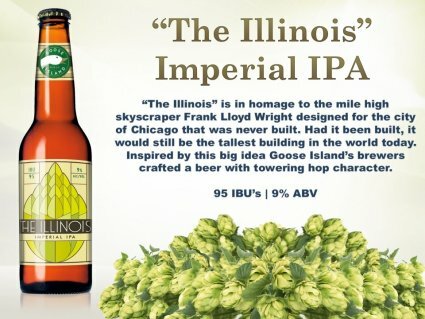 Watch for photos and beer reviews!